Amid recession, recalls and regulations, plants make strides to marry safety with efficiency gains. The recession led 40 percent of retail shoppers to seek cheaper products at the meat case. That's lower than the 50 percent of shoppers who have pared spending overall, but it still bodes poorly for meat, poultry and seafood processors seeking to add value to commodity products. The findings, jointly published in March by the American Meat Institute and Food Marketing Institute and sponsored by Sealed Air's Cryovac Food Packaging Div., indicate a move toward cheaper products and less brand loyalty. While that only increases the pressure on plants to operate with utmost throughput and efficiency and minimal waste, it's also critical for processors to combat any perception that during a recession they aren't cutting corners in their food safety programs. "The food industry is low-margin, and costs are always important," says John Surak, principal of Surak and Associates (www.stratecon-intl.com/jsurak.html), Clemson, S.C. "But no matter what, food safety is Job 1, quality is Job 2, and you're always concerned about both. So when you're designing a line or making upgrades, you build food safety and quality into the process. The food processor must have a food safety and quality culture first, so you never cut corners." Part of his job is consulting with processors to get them ready for third-party audits to food safety standards. In addition to being a consultant and professor emeritus at Clemson University, Surak led the U.S. delegation that helped develop the ISO 22000 international food safety standard. Automated boot washing systems reduce risk and get workers on the plant floor in 75 percent less time, aiding plant safety and productivity. He's also the former vice president of quality and food safety for Brooks Food Group and oversaw two food processing facilities, one an FDA-regulated plant and the other an FSIS-regulated facility. As such, he recommends processors know their safety plans inside and out. "I already knew where the potential issues were, and I wanted to see if the auditor would identify the issues and report them. I was already working on the corrective actions before the audit." No leading and few responsible processors will find this advice extreme; customers have long insisted on standards more stringent than the laws require. Minimizing human interaction to eliminate sources of risk. Offering antimicrobial agents – for workers, equipment and packages. Minimizing horizontal ledges where debris or pathogens can collect. Maximizing access to all food contact areas for easy cleaning. Ensuring that equipment such as cookers evenly heat product to ensure commercial sterility. Offering sanitary stainless steel motors and gearboxes to eliminate paint and to withstand wash-downs. Using new sanitary conveyor belting materials and accessibility options for easier cleaning. Using quick-release connectors and other means to reduce the tools needed for cleaning and changeover. Adding computer controls and operator stations at the line for greater automation of cleaning protocols. "We're doing more open designs for better inspection as cleaning is taking place," says Jeff Walker, director of business opportunities for food equipment operation at Sealed Air's Cryovac division (www.sealedair.com), Duncan, S.C. This includes more open designs such as see-through and perforated guards. Mechanical components, such as sections of conveyor lines, lift for more accessibility during cleaning. For example, he cites a bag loader (Model BL 101) that has a modular belt that allows the line to cycle if necessary. On the reduction of tools on the plant floor, he says this lets users dissemble equipment for more thorough cleaning as well as a reducing the risk of loose pieces and parts on the plant floor. Such features are included in an infeed system (Model 8604) specifically redesigned for the ready-to-eat processed meat. Quick releases on equipment like this turn minutes of loosening bolts into seconds. "It might not seem like a lot, but when you've got a certain amount of time to clean the plant, it adds up," he says. Walker says the company also has integrated third-party antimicrobial spray systems for use in Cryovac bags as well as using post-packaging pasteurization. Even further downstream, some processors use ovenable bags for raw or precooked meats, reducing risks directly at the consumer end point. Cooking is of course at the heart of safe processing, from retorts to fryers to ovens, where uneven temperatures can affect not just safety but quality, throughput and yield. "One of the big problems prepared foods processors have faced for years is uneven airflow in their ovens," says Doug Kozenski, processing systems sales manager at Heat and Control (www.heatandcontrol.com), Hayward, Calif. For example if there is less airflow on the left side of the belt than on the right, "It's going to take product on the left side longer to reach the required temperature, while product on the right side will be overcooked," he says. "This will result in longer cook times and lost yield." The company's AirForce impingement oven is designed to overcome that challenge with uniform airflow and heating across the width of the product conveyor. Air flows evenly from pressurized air reservoirs and nozzles above and below the product zone to ensure all product uniformly reaches the same safe core temperature. This eliminates the need to overcook to compensate for low temperature areas. The system's computer controls can be used to customize sanitation, with cleaning time and chemical use automated to meet varying product requirements. For example, Kozenski explains that cleaning requirements are "very different" for a batter-breaded product than they are for a glazed chicken wing. "For the glazed wing, you would typically design the cleaning cycle for a worst-case scenario, whereas with a breaded product for example cleaning requirements won't be as difficult." The U.S. House of Representatives last fall passed H.R. 2749, the Food Safety Enhancement Act of 2009; and the Senate continues work on its own bill, S. 510, the FDA Food Safety Modernization Act. Some form of this legislation is expected to pass into law, although it's difficult to predict what, if anything, will happen given the current climate in Washington. American Meat Institute President/CEO J. Patrick Boyle was critical of the House bill, saying, "We do not believe it is the proper role of the government to establish the hazards and mandate preventive controls." Additional points of contention deal with plant fees to pay for inspections, the extent of traceability requirements and the degree of power the FDA should have to impose civil penalties and determine whether a substance is generally recognized as safe. In February, U.S. Secretary of Agriculture Tom Vilsack announced new safety and quality initiatives for food purchased by the USDA for food and nutrition assistance programs, most prominently the (NSLP). They include an alignment of information sharing and testing standards across five USDA agencies including the FSIS that are intended to more closely align regulations with those used by restaurants and food retailers. This effort represents a building-upon the intent of the interagency Food Safety Initiative (FSI) begun under the Clinton Administration in 1997 that along with industry efforts, has reduced incidents of foodborne illnesses by coordinating activities between the FDA, CDC, EPA and USDA. Most recently, in March, Sen. Kirsten Gillibrand of New York proposed the Consumer Recall Notification Act to require notifications of recalls to be sent to health workers and retailers and have notices posted on shelves as well as sent to store members or "loyalty card" users. The oven's controls use a recipe-driven system that prompts the operator to add predetermined amounts of chemicals, and from there it automatically adds predetermined amounts of water and sets different run times for the various sanitation cycles. "This technology not only ensures safe processing but can reduce chemical and water usage and even contribute to sustainable goals by minimizing wastewater," Kozenski says. From turnkey lines for large-scale operations down to equipment for small plants, suppliers offer features for processors of all sizes. Even in a small plant, swing-open designs on saws from Hollymatic (www.hollymatic.com), Countryside, Ill., are "very easy to clean or replace blades because the tables don't come off, they swing open," says Rob Kovacik, manager of sales and marketing. "And the easier it is to clean equipment when you're going from beef to pork to lamb, the faster you can clean it." The company's roots are in the retail meat department; currently, about 60 percent of the company's machines are used at small to medium plants supplying them. Standards, including the Safe Quality Foods Initiative, are higher than government requirements in many areas, including hand- and boot-washing, notes Michele Colbert, vice president of sales and marketing at Meritech (www.meritech.com). The Golden, Colo., company provides automated washers for workers to sanitize the point of entry into processing rooms. She says "more and more" processors are implementing such systems either as a part of HACCP plans or broader standards, because traditional traffic (floor) sanitizers can be messy and hard to contain without being tracked though the plant. Upgrades and recession notwithstanding, Colbert says companies have tight budgets every year, "but every year there is still money set aside to improve employee hygiene practices. Rules are getting more stringent and companies are getting cited." Systems aren't justified in a vacuum; Colbert says plants owned by Cargill, Nestle, ConAgra and others have taken a 30-second hand-washing process down to 12 seconds, and with better results. "A large plant can get 300 or 400 employees clean and on the plant floor, and in 75 percent less time." The largest integrated systems can handle hand washing and boot scrubbing for 20 employees per minute and pay for themselves in a month. And while there's also a "green" water-conserving element to such systems, she notes processors are primarily motivated by operational issues. "They're under more pressure to provide safer and higher-quality food now more than ever." It's up to companies to do things right and pre-empt the critics who say the industry cuts corners in a recession. Colbert says she shudders when she finds meat plants that allow employees to wear unsanitary lace-up boots; that use hand-gel sanitizers instead of water-washing, "which just rubs blood around"; and cuts back management to the point where the plant manger temporarily replaces the quality assurance manager, even if he isn't qualified to manage a HACCP plan. Meat and poultry plants have undergone massive, multiple revolutions since Upton Sinclair's 1906 novel "The Jungle" put them under the public microscope -- figuratively and literally. Laws have changed, and companies long ago came to realize safety is critical to their goodwill with customers and their very existence. Today's industry is arguably safer than at any point in history in light of current HACCP programs and the broad array of food safety standards. Surak says equipment vendors can help processors not just by supplying equipment that performs well and is easily cleaned and sanitized; vendors may be able to pre-validate their equipment in accordance with the documentation required in a plant's food safety management program. "If the equipment is pre-validated, then the processor can reduce its validation and verification activities by showing that the equipment is operating correctly under the plant's operating conditions." Additionally, equipment that's operating well is less subject to unscheduled maintenance, as in a shutdown during production that could compromise safety and quality by backing-up processes and introducing distractions and risk. Plant equipment and the way personnel use it -- and clean it -- plays a critical role in preventing pathogens from popping up. 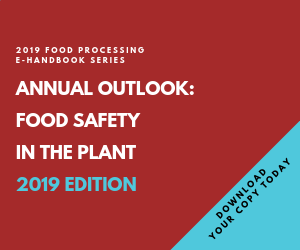 Recent recalls from hydrolyzed vegetable protein (HVP) to meat and poultry products illustrate how critical plant equipment and operations are to food safety efforts. Companies across many segments of the industry have recalled hundreds of products following the March recall by Basic Food Flavors after Salmonella serotype Tennessee was found on HVP processing equipment at the ingredient supplier's Las Vegas plant. The FDA reported the company ignored analytical tests results dating to Jan. 21 and "continued to distribute HVP paste and powder products until Feb. 15 [and] manufacture HVP paste and powder products under the same processing conditions that did not minimize microbial contamination." One outcome: The FSIS in March said companies may need to alter formulations or labeling for products containing the flavor enhancer to remain in compliance. It wasn't the meat but a container of black pepper that was found to have Salmonella Montevideo. That forced Rhode Island-based Daniele International to recall more than 1.2 million pounds of ready-to-eat (RTE) Italian sausage products. Even with no reported illness, Huntington Meat Packing Inc., Montebello, Calif., had to recall 864,000 lbs. of beef products in January and 4.9 million more lbs. of beef and veal products in February. Possible E. coli O157:H7 contamination was cited but the real culprit, according to USDA's Food Safety and Inspection Service (FSIS), was that the company's products "were produced in a manner that did not follow the establishment's hazard analysis and critical control points (HACCP) plan." FSIS, in meat and poultry plants every day, validates the use of HACCP programs that encompass performance standards for a wide range of risks, including chemical (screening tests for dioxin and melamine; residue testing for pesticides, penicillin; etc. ); biological (microbiological, bacteriological, viral, parasitic, mold, fungus, etc.) and physical (bone fragments, metal, sticks, bug mandibles, hair, droppings, etc.). Processing and packaging equipment suppliers go a long way to foster plant sanitation and therefore food safety with features that inhibit microbial growth and enhance cleanability. The management imperative to turn a profit can lead food industry critics to assume that in a recession, amid conservative budgeting and the consumer trend toward lower-priced products, companies will cut corners when it comes to food safety. "I don't buy that," says Keith Schneider, associate professor in the Food Science and Human Nutrition Dept. at the University of Florida (Gainesville). "The food supply today is probably safer than it's ever been. We're much better at finding problems and tracking them down. We have much better surveillance than we had years ago, by CDC and at the state level; and we also have 24-hour news, and we hear much more in the media about food safety incidents."